Coolmore Lexington Stakes 2014; Last Chance For Points On The Trail To Churchill: The GIII 2014 Coolmore Lexington Stakes is held annually at Keeneland Race Course in Lexington, Kentucky with this year’s rendition set for Saturday, April 19th, 2014. This “wildcard” race is run on the polytrack over the distance of 1 1/16 miles (8.5 furlongs) with 10:4:2:1 points to be earned for the top four finishers for a stall in the 2014 Kentucky Derby, with a purse of $200,000. 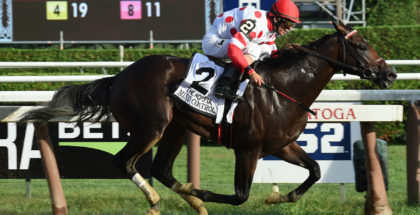 Mr. Speaker, pictured above in the Dania Beach Stakes, teams up once again with jockey Jose Lezcano in the Lexington Stakes on Saturday, April 19, 2014. This race was run as the Calumet Purse, an overnight allowance race, from 1973-1983 to be renamed the Lexington Stakes in 1984. It has been sponsored by Ireland’s renowned Coolmore Stud since 1998. The race record is held by Charismatic at 1:41.00 in 1999. The most wins by a jockey are by Jerry Bailey with 6. The most wins by a trainer are 5 by Todd Pletcher and 4 by D. Wayne Lukas. Last year the race was won by Winning Cause for Todd Pletcher in 1:43.93. On a side note, Winning Cause is running Saturday in the race prior to this, the Ben Ali Stakes, after racing on this track and coming in second six days ago on 4/13. The 2014 Coolmore Lexington Stakes is one of three stakes races on the 10 race card with a start time of 5:13 pm, EST and is the 9th race of the day following the Ben Ali Stakes. Last week Sigi Mendoza and I took on the Arkansas Derby. Sigi’s pick for the win was Ride On Curlin who came in second so Sigi hit the Place/Show. Nice cappin Sigi, he’s been on a roll! With Danza blowing out the field at 41-1, neither of our picks won. 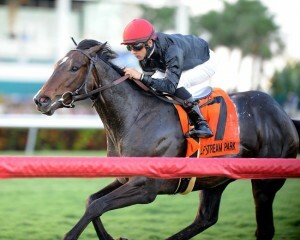 Mine was Conquest Titan who came in 5th and hopefully runs big in the Belmont where he looks better suited. My second and third pick Bayern & Tapiture came in 3rd and 4th. Now on to this weeks race. The 2014 Lexington Stakes started out as a smaller field and then all of a sudden got complicated for me with more entrants. After mulling this over all day Wednesday, I’m siding with the two Harlan’s Holiday colts and one of the Pletcher entries. The Josie Carroll trained, Ami’s Holiday, already has 10 points in the 2014 Kentucky Derby standings with his victory in the Grey Stakes (GIII) at Woodbine last October and could get a hoof in the gate here with a win to sit in the 21st spot hoping for a defection. If he gets a second, that would put him ahead of Big Bazinga with 14 points and more money. 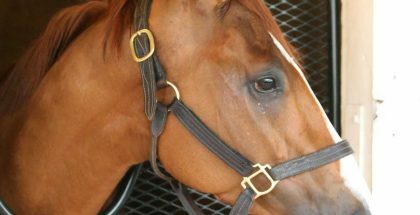 Ami’s Holiday, the bay son of Harlans’ Holiday was bred in Canada by Ivan Dalos’ Tall Tree Farm and he is a half-sibling to Carroll’s other Oaklawn string runner, Aragorn Ami. He broke his maiden first time out at Woodbine going 6f on the synthetic. All of his races have been at Woodbine and he has a race record of 4:2:0:1. Last out on December 8, 2013 he ran 3rd in the Display Stakes going 1 1/16 miles and was 5th going 1 1/8 miles prior on the synthetic in the Coronation Futurity. He has some nice works at Oaklawn where he was listed to run in the Arkansas Derby and they opted for this race instead. He recently worked at Keeneland on April 11th breezing 6f in 1:13.06, 1/2. Ami’s Holiday is making his 2014 debut here breaking from post #7 with Albarado in the irons. The other Harlan’s Holiday baby Poker Player is tossing the blinkers for this race and I like that. He has a win on this track last year going 1 1/16 miles in the (GIII) Bourbon on October 6, 2013 after breaking his maiden 3 weeks prior on September 14th. Last out at Turfway he was 10th in the (GIII) Spiral Stakes on March 22, 2014 and prior ran second to Solitary Ranger on March 1st at Turfway. He has three nice works on this track and looks ready to ante-up. If he gets the pace to close into, watch out. Poker player has Stewart Elliott up to ride and breaks from post #4. Call me crazy but I’m digging Supermonic on the short turnaround to hit the board here. The son of Latent Heat is coming off a win on this track April 13th going 1 1/16 miles where he set the pace early and cleaned up. He won his maiden a month prior on March 13th at Penn National. I’m thinking speedball here. He’s leaving from gate #10 with Joel Rosario working the whip. Thanks again to Sigi for taking the time to handicap his picks and plays, greatly appreciated! Good luck to everyone Saturday and safe ride! Beginner’s Tip: Food For Thought; A statistic I read recently online talked about wagering at Keeneland. Their view is that the New York and Kentucky horses often get overbet. The best ROI (Return On Investment) may be the Pennsylvania, Canada, Indiana and European shippers with the favorites winning 33% of the time in 2013.